Stephen Hawking has led, and continues to lead, a fascinating life; diagnosed with motor neurone disease while studying at Cambridge, leaving him paralysed and wheelchair-bound with only a voice synthesiser to eventually communicate, he has since gone on to become a world-renowned figure in science and physics as well as a central figure in disability support. His life has inspired one or two films about his life, including several documentaries and a 2004 television movie starring Benedict Cumberbatch, but unlike Louie Zamperini and his depiction in last month’s underwhelming Unbroken Hawking’s story has a much more emotional undertone to it with people who actually seem larger than life rather than just mundane leads and background fodder – something that is well and truly represented in The Theory of Everything. Every character and every emotional beat feels authentic and heartfelt without slipping into melodrama, and it is one of the few romances in recent years that is truly fascinating because of it. The crux of the film holds tightly onto the two lead performances of Eddie Redmayne and Felicity Jones and their chemistry as a couple, and not only do they work wonderfully together but they are also strong characters and performances individually. Much of the awards focus will probably be on Redmayne’s portrayal of Hawking, and it’s clear to see why; a breath-taking performance of physicality (or, if you’d rather, lack of it) and emotion, Redmayne allows us to see the pain and determination of the character even if he cannot properly control the muscles to express them himself, and after a while you’re gobsmacked to think that for a second you were actually watching the true Hawking instead of an actor. Jones, meanwhile, is a more able and traditional presence, and therefore the one with the most weight on her shoulders – her methods of coping with her husband’s condition combined with motherhood and attraction to nice-bloke Jonathan (Charlie Cox) start to take a toll on her, and you can sense her patience being forever pushed and tested with every obstacle that you truly feel sorry for her. Both are exemplary performances and certainly deserve to be talked about for the next couple months of awards season. As much as the film covers Hawking from his days at Cambridge to his diagnosis and beyond, the film truly is about the romance between these two people, one of whom happens to be physically disabled. As such, it’s an effective romance because the film allows us to get to know them and therefore care about them, both as a couple and as their own person. For instance, Hawking, as we first meet him, is socially awkward but also something of a playful spirit; while Jones’ Jane comes from a religious background and is thus more direct and stern than her counterpart. They play off each other to a charming degree, and even as their relationship starts to deteriorate simultaneously with Hawking’s illness there is still a strong connection between them that is genuine and eternal. They are what make the movie reach the highest levels it can manage, and it’s more than worth the price of admission to watch them be who they are together. Even when the film focuses more on Hawking’s deteriorating health and mobility than the central romance it’s supposed to focus on, it’s still fascinating to watch his progression being portrayed on-screen. The little twitches on his hand near the beginning, then his use of walking sticks and eventually his electronic wheelchair – which, after his iconic computerised voice is introduced, results in one of the greatest impressions of a Doctor Who villain ever put to film – are all conveyed for us tastefully by director James Marsh (Man on Wire), as are our glimpses inside his brilliant mind through Benoît Delhomme’s colourful and lively cinematography, in one instance stemmed from the simple act of putting on a jumper. The musical score, by Icelandic composer Jóhann Jóhannsson, exhumes beauty and drama to match the situation wonderfully, while Anthony McCarten’s screenplay is rich with wit, intelligence and sensibility. As for the film’s depiction of MND, this reviewer couldn’t possibly comment fairly due to their lack of personal experience with the illness – unless one counts the ALS Ice Bucket Challenge craze that swept the world last summer – and that to write about it without the knowledge and full understanding of the disease would be something of a disservice to such a topic and illness. As is, the reviewer will assume that the treatment taken by the filmmakers and actors was treated with as much care and attention as possible, and that they tried their hardest to accurately portray the symptoms and physical defects commonly associated with the disease with a steady and thoughtful approach. 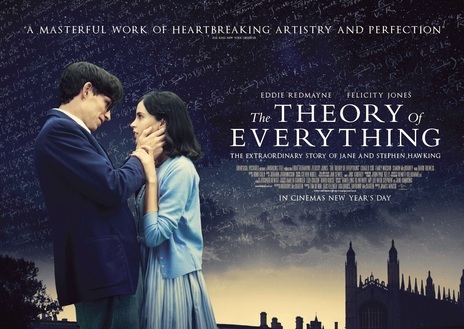 The Theory of Everything is a beautifully-made film exploring the life and love of the immaculate Stephen Hawking, anchored by two fantastic performances by Eddie Redmayne and Felicity Jones, James Marsh’s strong direction and Anthony McCarten’s script which presents to us an uplifting and heart-breaking romance without diving into easy melodrama.